I found this recipe on the internet but have tweeked it a little - reduced the number of egg whites, increased the water and use olive oil instead of butter." Add the water, olive oil, egg whites and vinegar to the dry ingredients. Spoon the dough into French baguette pans that have been sprayed with canola oil. Smooth the top with a wet spatula. Lay out a piece of plastic wrap and lightly spray with canola oil. Place this lightly (oiled side down), over the dough, and set to rise in a warm place until doubled in size. Remove from the pans and allow to cool on a wire rack. The mixture is quite sticky, and I find that the best way to get it into your baking pans is to use a plastic spatula. I have a jug of warm water on the side and dip the spatula into the water each time, this stops the dough from sticking to the spatula. The dough rises quite fast and will at least double in size. 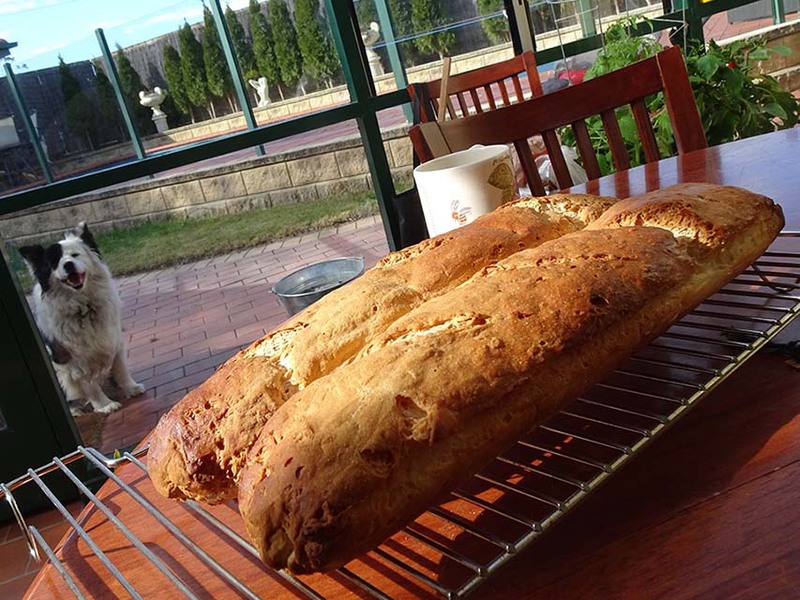 Adapted from http://blog.kitchenwaredirect.com.au (Gluten-Free Recipes; French Bread by Katherine Cortes). Updated 15 April 2018. I was making this recipe one day recently and thought of reducing the quantities of sugar and yeast (the original recipe had 1 1/2 tbsp of each in it). I also wanted to try and simplify the method, so instead of adding the yeast and sugar to the warm water, I added the yeast and sugar in with the dry ingredients. The water was added with the wet ingredients and it works just as well.